The one thing I have always loved about the fresh produce industry is the unexpected. During a recent training class, where I had opened the session up to questions of all kind, I was asked if new top growth was a defect for topped carrots. This is an easy defect to determine if it is a scoreable defect; if you find a carrot with new top growth, in excess of 1 inch in length, set it aside and score it as a defect. 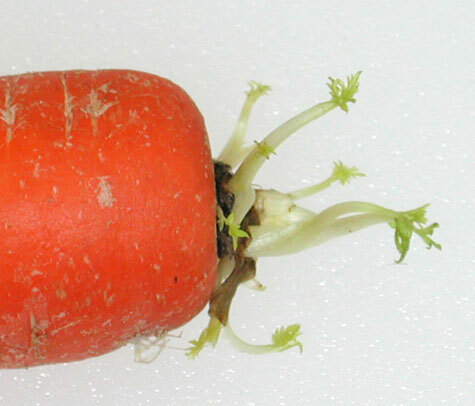 Score the carrot with new top growth as a defect, against the 10% tolerance for total defects. If you have less than 10% defects, the lot is in grade; if you have more than 10% defects then the lot will fail to grade. But the USDA did drop the ball on this defect, can carrots with new top growth be scored as serious damage? They offer no scoring guideline. You will have to use your judgement and determine if the new top growth is seriously affecting the appearance, maybe if the new top growth is in excess of 1-1/2 inches. If so, the carrot would be scored as a serious damage defect, against the 5% tolerance for serious damage.